It’s Finally Here! Release Day! I’m so excited to announce that Call of Elespen, the fifth and final book of the Keepers of the Wellsprings series, is now available on Amazon! Check out all the illustrations from Call of Elespen here. Today only, November 29, 2017, in celebration of the completion of the series, I’m offering books 1-4 for free! When I wrote this series, my hope was to capture a world that would enchant my readers and bring them to a place they’ve never been before. To me, the joy of reading is the escape of it. Growing up, I had few friends. I imagined them in the forests where I wandered, as fairies, and I imagined them in the pages of books. In the Keepers of the Wellsprings, my hope was to create friends that would capture my readers’ hearts, just as those in the books I’ve read have done for me. Finishing the series has been bittersweet. I’m relieved to have been able to tie up to so many strands of the story so neatly, but it’s sad to say goodbye to these characters who seem so real now. Rest assured, though, I don’t think I’m finished with these folks just yet. I intend to take a break, but there are so many stories to write, yet, from the world of the Wellsprings. I’ll be adding even more posts to the list as they go up, so please make sure to check back! The epic conclusion to the Keepers of the Wellsprings series is almost here, and you know what that means: It’s time for a cover reveal! If you’re familiar with the series so far, you know that I have illustrated designed all of the covers myself. It has always been important to me to make sure each cover is unique enough to be attractive on its own, but consistent enough with the rest of the series that it looks like a series when all of the books are displayed together. To do this, I really thought about color, giving each book its own unique palette and tone. I knew Kythshire, for example, would be blue and gold, because those colors appear prominently in the book. They’re the colors of Azi’s guild, and the colors of the golden field she visits in Kythshire. For Call of Sunteri, I chose red for the dye fields Tib escaped, and gold for the wings of a prominent fairy in the book. I won’t say who, just in case you haven’t read it yet! For Call of Brindelier, it had to be purple for the mystery and majesty of the hidden kingdom of Brindelier, and gold, of course. This time, for Azi. For Call of Hywilkin, I knew I wanted flame orange and yellow to represent the fiery mountain of Kerevorna, and the wings of its Keeper had to be very distinct. I also wanted it to feel quite ominous because of the dark, dramatic tone of this book. Finally, here we are at Elespen! As the final book in the series, I hoped to make this cover really stand out. This book and its cover had to feel like a triumph. I wanted it to feel mysterious and creepy, but also bright and hopeful. I painted the wings to seem like they could be a butterfly in a rain forest jungle, and gave them eyes to make them curious and interesting. It was important that the green felt like a jungle, with all of the wonder and danger that the idea of a jungle invokes. I wanted it to feel ambiguously good and evil, beautiful, and unnerving. My favorite part about this cover is how the area beneath the wings feels like a portal into a strange blue sky or tropical water, which happened accidentally as I was painting it. Without further delay, here it is, the cover reveal of Call of Elespen! I’m still planning on releasing the book in the later part of November. I promise to keep you updated! In the meantime, you can download Call of Kythshire for free today, in celebration of my cover release! Enjoy! I just wanted to write a quick note to let everyone know I’m still here, and I’m still writing! The conclusion of the Keepers of the Wellsprings is taking up every bit of my time and energy, leaving little time for blog posts. The majority of the book is already in the hands of my trusted beta readers, and is so far very well received. This ending is going to be EPIC, and I’m really excited to get it out to the rest of you. I’m still hoping to release in November. Keep an eye here for news, and as always, I’d love to hear from you. Post a comment here to say hello or ask a question, or send me an email if you’d like! See you soon!! Enchanted lands, magical creatures, fairies and witches and … space wizards? You bet! We’ve got all that and more for our Fellowship of Fantasy March ebook giveaway. Sixteen authors are offering sixteen adventures, along with a little something extra to make your month magical. Keep reading to learn more and get a closer look at a few books in the bundle. Elina Faramar finally leaves her family’s flying carpet shop when her father reluctantly agrees she can take magic lessons in nearby Kamikan. Urban life promises adventure, and new friend Kara shows her the sights. However, Elina soon sees a darker side of life: a foreigner arrested at the circus, forbidden schoolhouse rooms with odd comings and goings, and unsociable pupil Simeon’s shady deals at the docks. Everything seems connected to the volatile neighbouring country of Pallexon, but no one will tell her why. When Elina and Simeon develop a magical mind link, he seems close to confiding in her. But an unexpected voyage takes Elina and Kara away from answers and towards unknown danger in Pallexon. Alone in a strange country, with no identity papers, the situation rapidly turns into a nightmare when Kara is mistaken for a spy. With her own freedom at stake, Elina must rely on her wits and magic to save her friend and unravel the secrets of Pallexon. Have a look at the entire collection of ebooks, and enter below to win them all–as well as a custom wand similar to the ones pictured here–for your very own. Click here to enter, and good luck! EVERYONE! I am so excited for the week ahead. Call of Hywilkin has its official release this Friday, March 3. To celebrate, I’ll be offering Call of Kythshire, Call of Sunteri, and Call of Brindelier for free for that one day only! Are you ready to explore Hywilkin? Here’s a desktop wallpaper I made with some of my favorite illustrations from the book. Feel free to download it and use it (personal use only, please)! My website is all ready to go, with a face lift to match the color scheme of the new book. 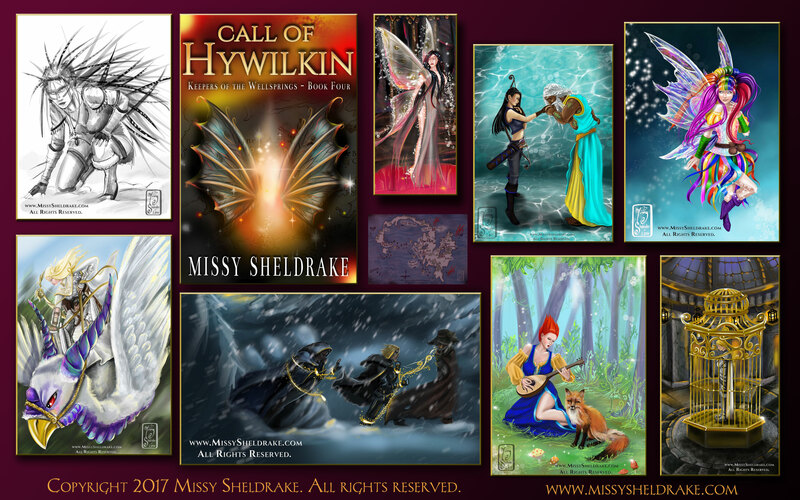 I invite you to read an excerpt from the book (spoiler-free) and check out the illustration gallery (not so spoiler-free). This week also happens to be #RobotPartyWeek. I’m told it has nothing to do with robots or parties, but anyone following the hashtag on Twitter will find free books from fantastic indie authors! Check it out this week, the week of Feb 26-March 4. I’m also working on a fun interview between Flitt and a character created by author Ember Winters which she’ll be posting this Friday, and I’ll have a fun Realm Explorers by Annie Douglass Lima interview going up March 6 telling all about the Known Lands. With all that to look forward to, it’s going to be a great week! What do you have going on? I’d love to hear about it in the comments!